Caramel Apple Cupcakes: just like the favorite fall treat! 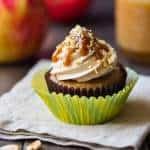 Caramel apple cupcakes: so perfect for fall! Subtly spiced apple cake, salted caramel buttercream, caramel sauce, & a sprinkling of chopped peanuts! It’s really feeling like fall now! Boy things have cooled off nicely, and I’m starting to see the leaves falling. This morning was cool and foggy, and I needed a thick fleece to walk my kids to school. I don’t know about you, but I’m really starting to feel the caramel apple vibe. Caramel apples have always been a favorite fall treat for me. I pick them up in the produce section every year at this time, and I’ve even made them myself! I especially love the kind that are covered with crushed peanuts. It’s such a great flavor combo and I love all the textures too! Check out my “Caramel Apples” post for a great how-to, plus video! But for today’s recipe, we are making a cupcake version! 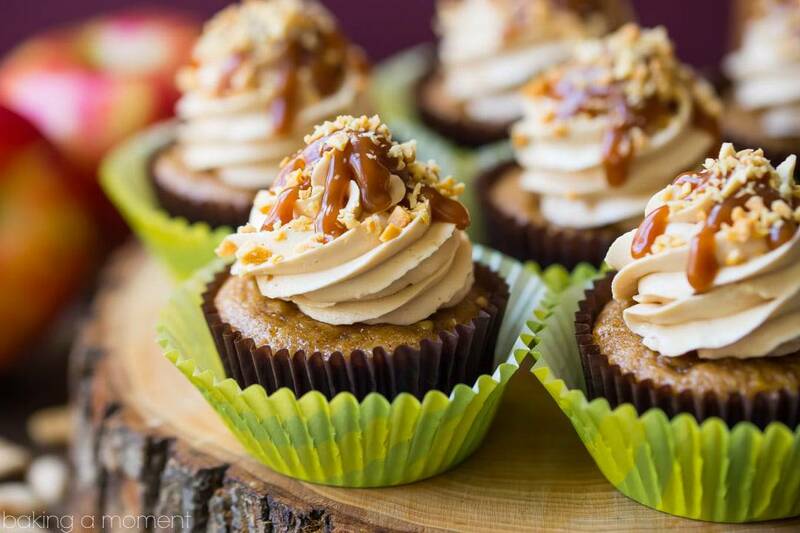 Caramel apple cupcakes, how yum, right? So it’s a moist apple cake on the bottom, with just a hint of cinnamon to bring out the fall flavors. Super-simple to make and they bake up perfectly every time. You can use any kind of apple that holds up well for baking, but my favorites are Granny Smith or Honeycrisp. Next comes the buttercream. This is an American-style buttercream, made with butter and powdered sugar. But, we are adding a magic ingredient: salted caramel sauce! You’re going to love what the caramel sauce does to the texture of this frosting. It’s really fluffy and creamy, and nice and stable. Just make sure the caramel sauce is COMPLETELY cool before adding it, otherwise it will melt the butter and your frosting will be way runny. For garnish, reserve a little of that sauce to drizzle on top, and then add a sprinkling of chopped peanuts. 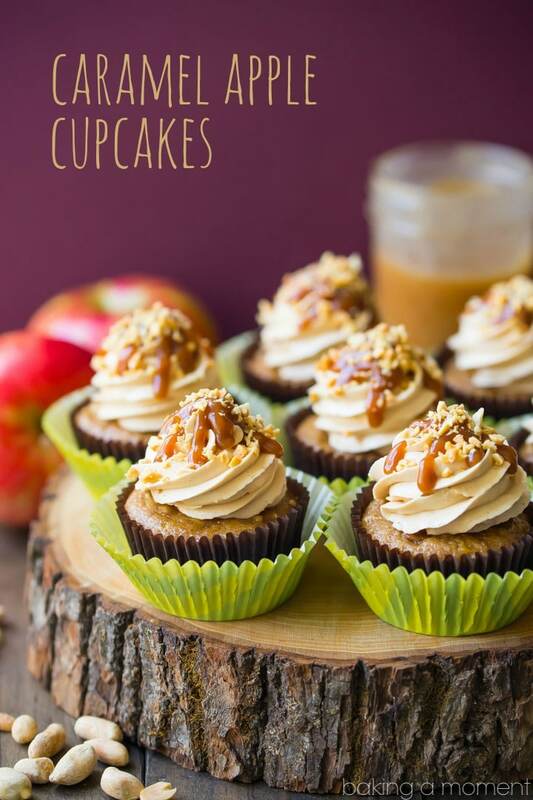 Just like the caramel apples that inspired these cupcakes! These would be so much fun for a Halloween party, or really for any fall get-together. I hope you’ll give the recipe a try! Preheat the oven to 325 degrees F, and line cupcake tins with papers. Place the flours, brown sugar, cinnamon, baking powder, baking soda, and salt in a large mixing bowl and whisk to combine. Place the oil, apple cider, eggs, vanilla, and lemon zest in a large liquid measuring cup, and whisk to combine. Pour the liquid ingredients into the dry, and mix together on medium speed for about 1 minute. Divide the batter equally between all 18 lined wells of the cupcake tin. Bake for 18 to 22 minutes, or until a toothpick inserted in the thickest part of a cupcake comes out clean or with a few moist crumbs. Cool completely before topping and garnishing. In a larger pot, combine the sugar, corn syrup, and water. Heat over a medium high flame, swirling the pot occasionally to distribute the heat evenly. Place the butter, powdered sugar, and additional salt (if using) in a large mixing bowl and whip together until pale and very fluffy. Add about 3/4 of the cooled caramel sauce, continuing to whip until well incorporated. Transfer the caramel buttercream to a pastry bag fitted with a jumbo open star tip. Pipe the buttercream onto the cooled cupcakes, drizzle with the remaining caramel sauce, and top with chopped peanuts. *Cake flour is finer and lighter than all-purpose flour and it helps the cake to have a finer crumb and a lighter texture. I prefer to use it for that reason. If you want to skip it though, you can replace it with an equal amount of all-purpose flour. The cake will just be a little more dense and heavy. **From about 1 1/2 medium sized apples, peeled & cored. Novice baker..first time caramel maker! Everything came together beautifully. Wonderful! I’m so glad it worked out well for you. Thanks for the great feedback! 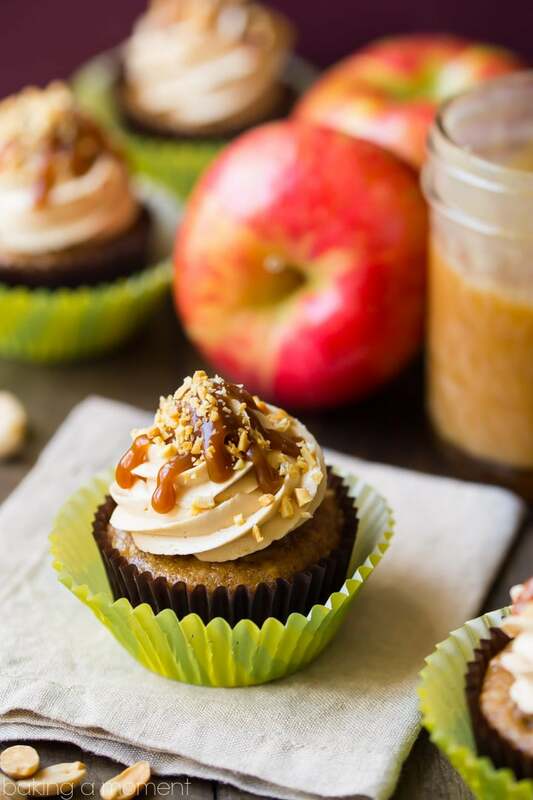 The best of fall flavors are going on in these caramel apple cupcakes! They look so delicious! What an indulgent treat for this time of year! Sounds perfect! What a lovely fall treat! I tried these cupcakes, and I used the cake flour and all-purpose as instructed; however, I noticed the cupcakes didn’t rise. Could this have been because of the type of apple that I used (McIntosh)? Hey Bethanie! Sorry to hear you had some trouble. Was your apple very juicy? It’s possible if it was very wet it could have weighed down your cupcakes. Maybe next time try straining the apple for a few minutes before adding it in to the batter. I noticed for the buttercream you are only using 1 1/2 cups of powdered sugar. I usually use 4 +cups for regular buttercream. Just wanted to make sure that is right. Really want to try this recipe. It’s right. The frosting is also sweetened with salted caramel sauce.